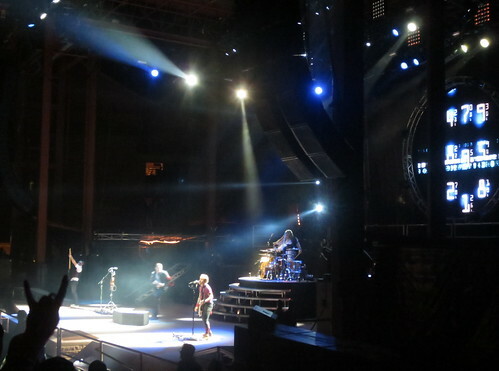 A week ago Tuesday, September 10, the Carnival of Madness came to Red Rocks Amphitheatre in Morrison, Colo. Shinedown headlined, with Papa Roach, Skillet, In This Moment and We As Human. 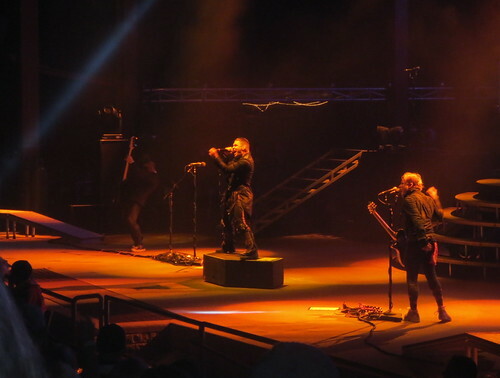 Given how much I raved about Shinedown last time they were in town and given the fact that this show was at Red Rocks, only the coolest concert venue ever, it was obvious that I was going to buy tickets. Unfortunately, like last time, Brandon couldn’t go with me. This time, it was due to him upgrading to captain and therefore being in airline training. 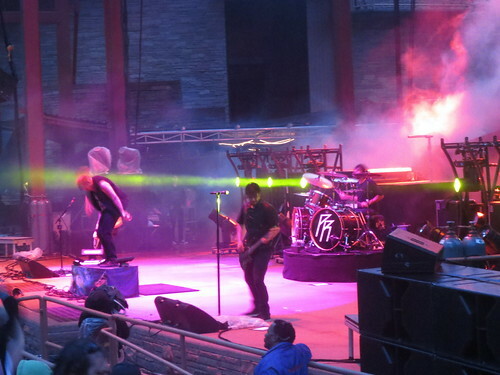 Luckily he was able to go to their St. Louis show on 9/7 thanks to my cousin Mike, who does sound for Papa Roach. 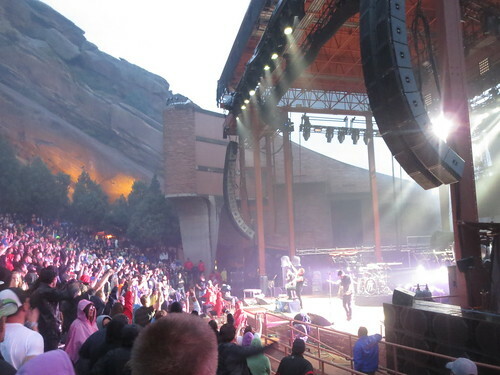 In any case, unbelievably awesome show in the rain. 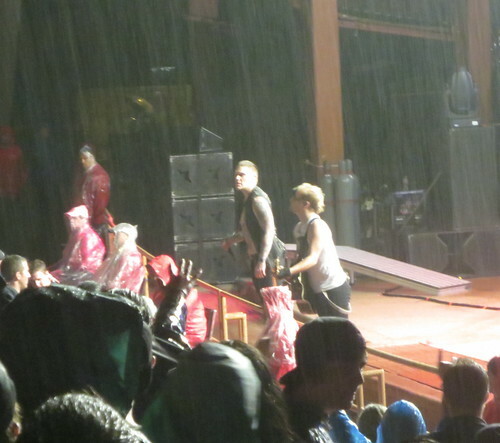 It rained off and on from when I got there (at the end of In This Moment) until the Shinedown set … where it dried out until the encore when it poured and pretty much didn’t stop for the rest of the week. Also thanks to Mike’s unbelievable generosity, I got a set of drumsticks (Tony Palermo; Papa Roach), some PR guitar picks, a shirt (with a sugar skull! 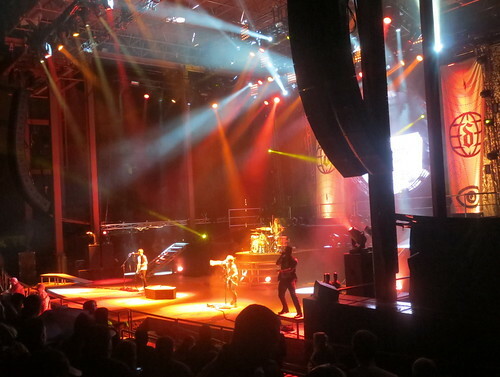 ), and a VIP pass so I could watch part of the Shinedown set from the sound booth and hang out with Mike on the bus. 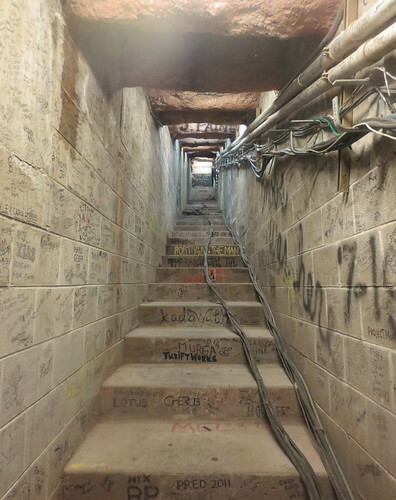 The only thing I asked for – and felt a little guilty for – was to see the legendary signature tunnel at Red Rocks … and it was totally cool and totally worth it. Any regrets? Brandon thought I might have been able to meet the bands … which may have been possible after the show if it weren’t for the horribly miserable rain, but as AWESOME as that would have been, it wasn’t something I was expecting. So yeah, a little sad, but can’t be sad about something I never thought I would get. My main regret was actually not getting a picture of me with my cousin, since I rarely see him. Dangit. I also regret not getting to the show earlier for a better spot. 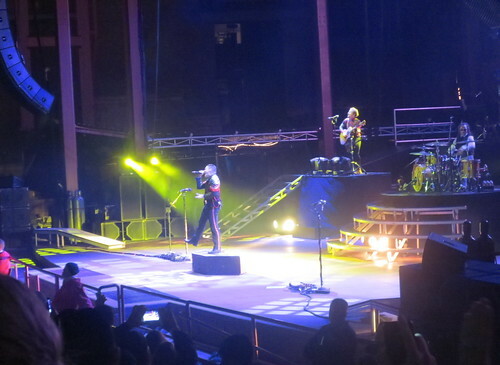 I was waaaay off to the side – obstructed view, they’d call it – and couldn’t really grab good quality photos. Boo. In This Moment. I missed most of their set – what little I heard wasn’t bad, though. 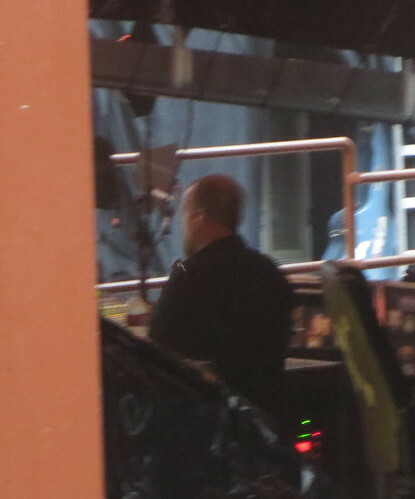 I did miss the other opening act, We As Human, so I can’t speak to them. 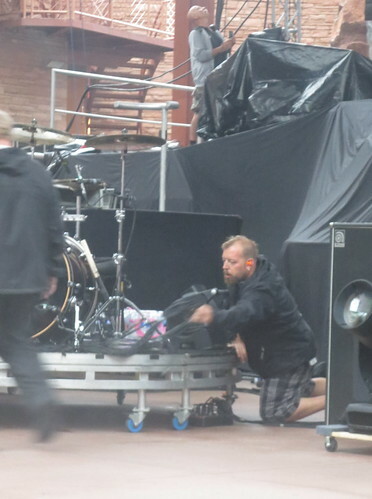 Mike setting up on stage with his crazy orange in-ears. Creepin’ on Mike while he’s doing his actual job of sound mixing. Crowd totally into Papa Roach. 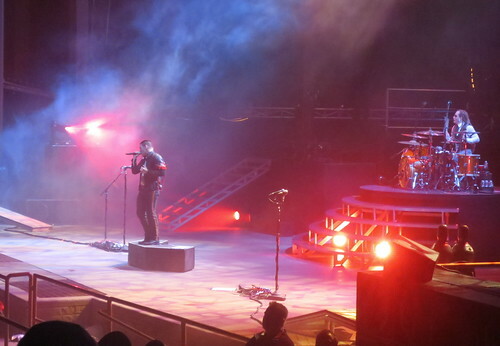 While yes, I mainly got tickets for Shinedown, it was really cool to see Papa Roach live – they put on a great show. 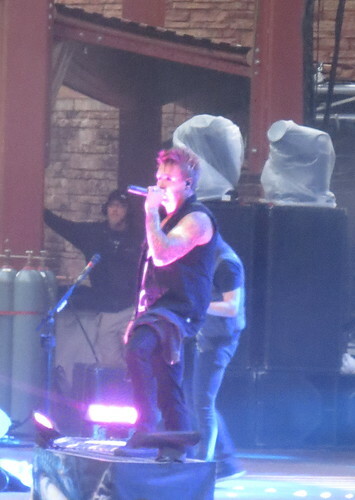 Very high energy – lead singer Jacoby Shaddix kept hopping into the crowd and I swear went at least 30 rows up. 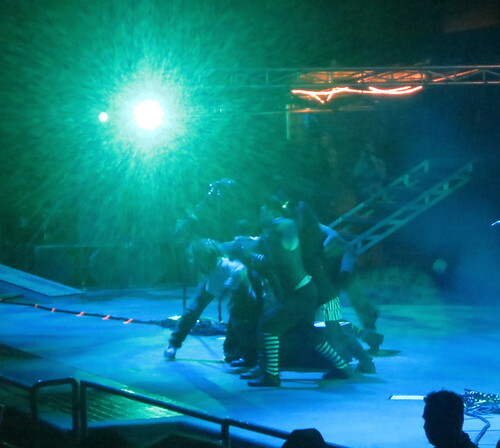 They are entertainers for sure and it was fun to see. 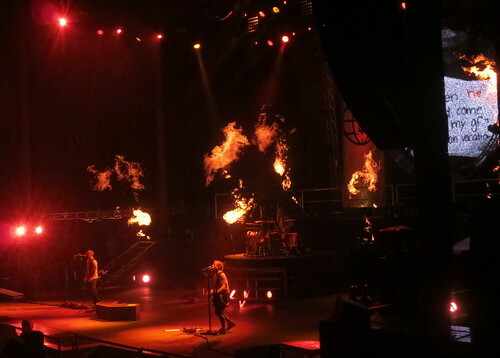 Next up was Skillet – they and Papa Roach switch off on the tour as to who’s second to the main act. 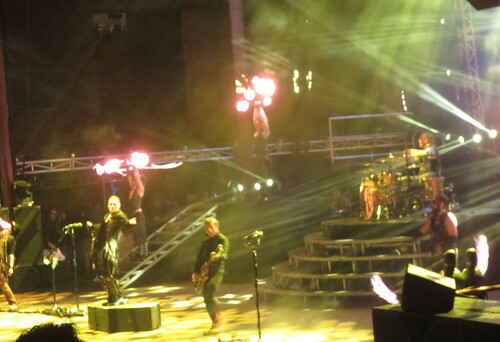 Skillet is a Christian group and seemed a little out of place on the tour, honestly. The music wasn’t bad and I liked a few of their songs, but the energy? Lacking. I saw a whole bunch of people sitting down during their set and that shouldn’t happen during an awesome show. The music should speak to you so you WANT to stand and sway and clap your hands and stomp your feet or what have you. 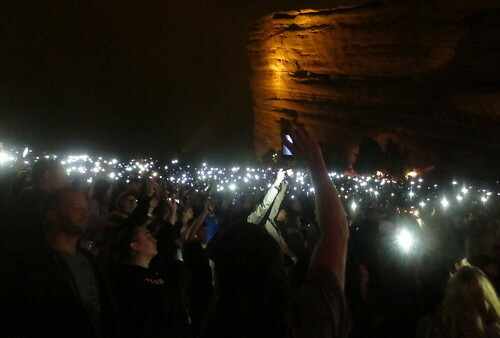 Skillet didn’t inspire that in the crowd. 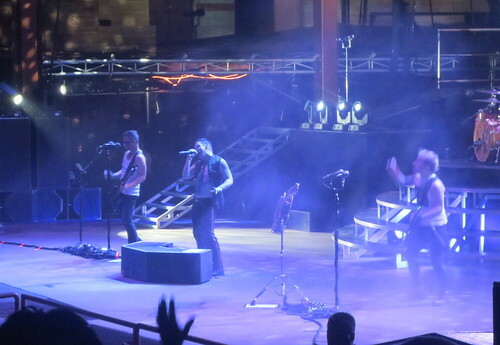 I basically used the Skillet set to wander around to try and thaw my limbs out … which meant buying a sweet burnout Shinedown tee at the merch booth and talking with Mike quite a bit. I was okay with this. 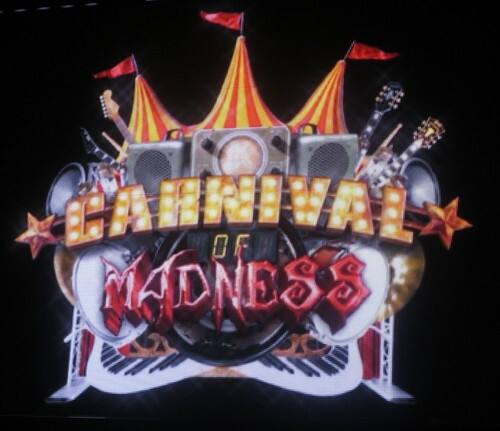 Logo on the video boards. 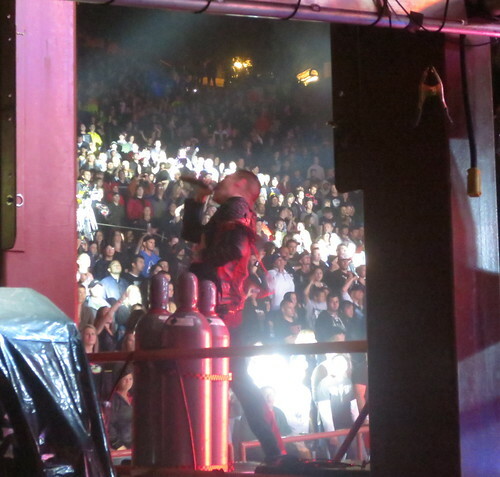 The creeper view of Brent Smith (that is, from the sound booth). Best perk of being back here? 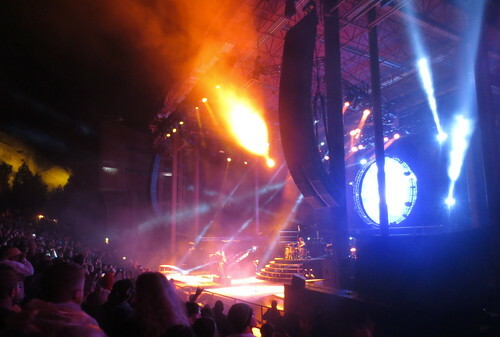 Closer to the pyrotechnics – warmth! 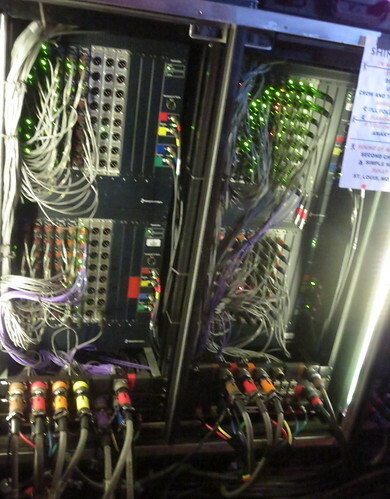 These cords make the music happen. Also: set list. Closer view of Zach Myers and his AWESOME ARGYLE SOCKS OMG WANT. Yes, I like argyle. 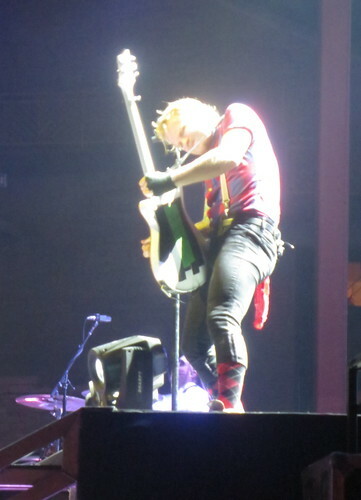 Yes, I lusted over his socks. Yes, I’m weird. 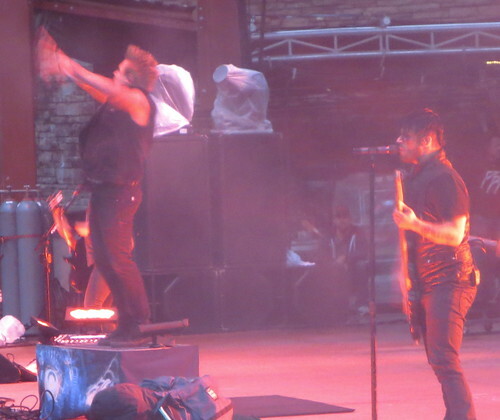 Brent Smith and Zach Myers on the railing (in the rain) for “45”/”Simple Man.” Getting soaked like the rest of us.